Teaspoons, Jigger, Stirrer (long Spoon), Straws, Collins Glass. Combine all of the ingredients into an ice filled Collins Glass, and give it a good stir. 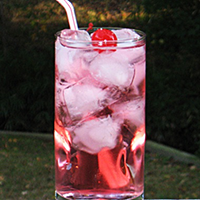 Insert a long straw, drop in a Cherry to garnish, and get ready for a smooth ride on your... Pink Motorcycle. Cheers!